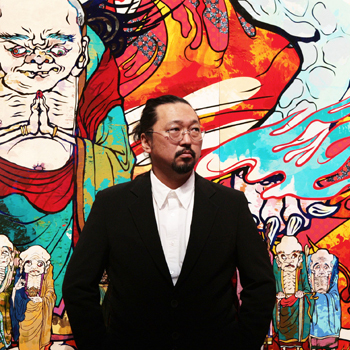 Takashi Murakami is the originator of the “Superflat” Theory and the artist most associated with its tenets. He has maintained a multifaceted career as an artist, curator, collector, film director, and the founder of Kaikai Kiki Co., Ltd.
As a curator, Murakami organized a trilogy of exhibitions, beginning with SUPERFLAT ( which traveled from Parco Gallery, Shibuya to MOCA, Los Angeles and other museums) and continuing with Coloriage (Fondation Cartier pour l’Art Contemporain), and ending with Little Boy (NY Japan Society), which was awarded the prize for Best Thematic Show by AICA-USA (International Association of Art Critics United States). In 2016, the first episode of the original anime series 6HP (Six Hearts Princess) was aired on TV. He is currently preparing to release a new live action feature film, Jellyfish Eyes 2.